Join our mailing list for new product updates in your inbox! 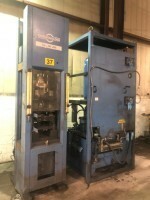 7.5 hp High Speed Disperser, variable speed, hyd. lift. Flowtronics Inc. Rotary Airlock, 3/4 hp gear reduced drive, 6" inlet. Our new arrival page consists of items we recently purchased. New arrivals last about 30 days before they leave this page and can be found in the regular inventory section.